It may ascend straight from your wrist or out of the Life Line or from the Mount of Moon or from the centre of your palm. Ascending from the Life Line (2-2) your triumph may be created by your own effort and merit. The early days in your life this kind of Fate may be restricted. Your surroundings and the circumstances are not favourable to you at that time. Hence you have to sacrifice a lot for your parents or kiths and kin. You have to fulfil the desires or your parents in those days. If the Line of Destiny or Line of Fate continues its journey strongly and clearly from where the line leaves Life Line then you may surmount all types of difficulties in your life. You may get success through your merit and effort. You have not depended on fate any time in your life. One more significant and outstanding point is that the years or date marked on the Line of Destiny or Line of Fate into your palm may be observed to concur with the year of your life. In this year you may declare your liberty and do what you long for. If this date is observed then it may be most significant in your career. 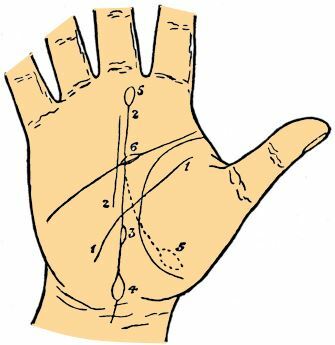 If the Destiny Line or Fate Line climbs from your wrist (1-1) and ascends straight to the middle of your palm to the Mount of Saturn then the Line of Sun (4-4) may be observed well marked, brilliance, luck and victory may present the Fate. Hence you may expect excessive good fortune. Climbing from the Mount of Moon (3-3) your Destiny or Fate may be much more exciting, variable and it depends on the caprice and fancy of other persons. If this type of line is observed merging with the Line of Heart (1-1) then you may spend a prosperous and happy conjugal life. Romance and some lucky circumstances may play vital role in your life. When the Line of Destiny is straight but with the line going through and merging it from Mount of Moon (5-5) then your fate has been assisted by some outsider’s influence. Normally it is a sign of influence of opposite gender to you. If the line of control from the Mount of Moon does not mix with the Line of Fate or Line of Destiny (2-2) then it indicates that the life of other person may always stay different. The control may remain only for the period of the time that runs by your Fate. If this control line cuts Fate Line or Destiny Line and leaving it and travels for few distances to the Mount of Jupiter (3-3) then it denotes that the person may only be concerned to you by his own ambition. It means that the person may apply you for fulfilling his ambitions. He may leave you when you are no longer of use. Normally it is observed on the palm of a woman than the palm of a man. 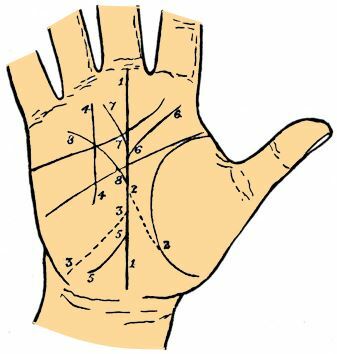 If the Line of Destiny or Line of Fate climbing the palm sends a derivative from it to the any Mount like the Jupiter, Mercury or the Sun the Fate or Destiny may be much more related to the class which the Mount comes up to near the sign. When this type of line is observed going or approaching to the Jupiter (6-6) then it indicates the duty, strength of command over other people or some higher rank that may begin to be recognised from when the derivative leaves the Fate Line or Destiny Line. If this kind of sign carries on its course and ends on the Mount of Jupiter then it is one of the most important marks of victory which is observed for specific purpose or ambition. When this derivative climbs to the Mount of Sun (7-7) then the success may be towards the wealthy and public life. It may provide you huge name and publicity. It is a crucial mark of success. If the derivative ascends to the Mount of Mercury (8-8) then you may get the success in the field of commerce or science. When the Line of Destiny or Line of Fate does not climb to the usual place of Mount of Saturn and goes to the other Mount then the entire effort of your life may be traced with whatsoever characteristic that specific Mount indicates. This type of indication does not be regarded as the obvious marks of victory as when Destiny Line or Fate Line remains to its place and forwards its branches to the specific Mount. If the Line of Destiny or Life of Fate climbs to your palm without any branch and goes like a solitary way to the Mount of Saturn then you may be a child of Destiny chained to an iron path of situations. It may never be possible to you to turn away the trials of your Destiny or Fate or lessen it anyhow. You may not get help from people. This type of sign of Destiny or Fate right through the palm does not regard as the good line of Destiny. To be a truly good Destiny Line or Fate Line it must not be marked so deeply but to mark it distinctly and clearly and comes with the Line of Sun in any form. When the Line of Destiny or Line of Fate goes over Mount of Saturn and ascends to the base of your finger then it indicates an inauspicious outcome. If you take charge of anything then everything may get out of your control. Even actually you may not know when or how to end. If the Line of Destiny seems to be ended by the Heart Line then you career may be destructive. You may never achieve success. If the Line of fate or Line of Destiny merges with the Line of Heart and climbs together to the Mount of Jupiter (1-1) then you may possess contentment through your affections. You may be assisted through adoration and affection to achieve your highest aims. You may fortunate in respect of your friendship. You may get their love. You may be assisted by people. If the Line of Destiny or Line of Fate seems to be stopped by the Head Line (4-4) then it denotes that your career may be ruined through your foolishness and stupidity. 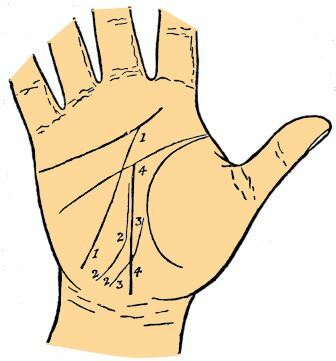 If the Line of Destiny or Line of Fate makes it presence farther in the middle of the hand which is known as Plain of Mars then it denotes that you may face a hard life in your early days. You have to fight to achieve something. If this line climbs distinctly and strongly from Plain of Mars and possess branch to the Mount of Sun then you may turn into architecture of your own fate. You may get success without anyone’s assistance. Your merit and hard work may provide you the ultimate success. If the Line of Destiny or Line of Fate climbs from the Head Line along with distinctly marked then you may get everything in your life late. You may obtain it through your own intelligence. If the Line of Destiny or Line of Fate is observed with a branch on Mount of Venus and the other branches on Mount of Moon, then it denotes that your career may be full of passion and romance through which you may get success to persuade the entire Destiny or Fate. If the Line of Destiny or Line of Fate ascends the Line of Life on Mount of Venus (2-2) then your fervent adoration may affect your entire career. It is found that these kinds of people normally place their fondness on impossible persons or on those who are involved in conjugal relation or else who are not able to satisfy the love which people demands. It is the most unfortunate mark for affection to discover the palm of a female. If the Line of Destiny or Line of Fate is found broken then your career may full of difficulties and splits. You do not possess anything for long period. You may not get success continuously. A spilt in the Line of Fate is not indicates a bad fortunes to you for all the time. If one part starts before the other edges then it indicates that you may feel the entire change in your surroundings. If this new line seems straight and good then the changes may bring advancement in the position starting at the time when the 2nd line comes first. If any tiny line merges with the Line of Destiny or runs as an assistant line then it normally denotes the marriage date when it is joined (3-3). You may not likely to marry if these lines don’t merge in spite of influence and affection’s presence in your career. If any of these influence signs comes beside the Line of Fate or Line of Destiny and crosses by it to the Mount of Mars then it denotes that the control thus observed may go to the detestation. 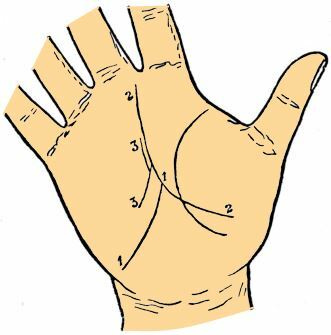 It may hurt your career if it is observed on your palm (1-1). If the Line of Destiny or Life of Fate is doubled then it is known as Double Life (2-2). If these 2 lines merge after running parallel for some distance then it denotes that this Double Line has been formed by the great affection which surroundings are not allowed to union. But it may be rooted out when these 2 lines are merged. If the Double Line of Destiny is distinctly signed, particularly when they go to the different Mounts of your palm then this type of sign denotes that you may carry out 2 careers simultaneously. One may be your main career and the other may be your hobby. 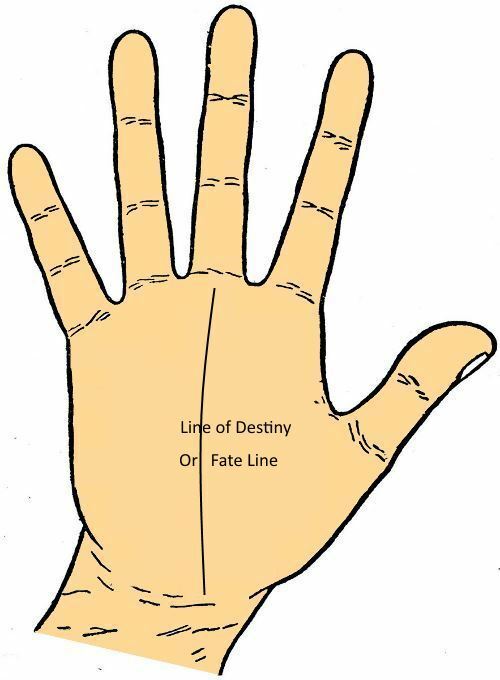 If the Line of Destiny or Line of Fate is excessively obscure or only be drawn through your hand then it may denote that you may possess disbelief in the thought of Destiny or Fate. Frequently it is observed in the palm of very selfish person who rises up against the thought that he is ruled in anyway by Destiny or Fate or by any influence. If it is observed along with a well distinct Head Line then you may certainly win through your mentality. But it may not be capable of predicting the details of your Fate or Destiny. You should satisfy yourself with mostly describing your features, oddness etc. If your hand does not contain a Line of Destiny or Line of Fate and just contain only a normal Line of Head then there is not anything specific to say about your Fate or Destiny. Basically, you may lead a colourless life. Neither anything affects you nor may you be affected on anything. You may be found a very little chance to lighten your monotonous life. If you possess an island (3) in the Line of Destiny or Line of Fate then it may be a very bad indication to you. If it is observed at the commencement of line (4) then it denotes few mysteries in respect of beginning career. If an island is observed on the palm of a female connecting with the Line of Destiny or Line of Fate with Mount of Venus then it is an obvious sign of her seduction (5). If an island is found in the any portion of a Plain of Mars then it denotes a duration of great troubles, loss in your profession (3). If an island is observed on the Heart Line and Fate Line then it denotes that you may incur loss for your stupidity or lack of prudence (6). You may suffer from the problem related to the love affairs if an island is located over the Destiny and Fate Line in your palm. If an island is situated on the Mount of Saturn or to the finishing of the Destiny Line (5) then it predicts that your career may end in misery and poverty. If the Fate Line ends at a zippy along with a cross then you may expect a fatality. If the cross is observed on the Line of Fate and on Mount of Saturn then the end of this type of Destiny may be full of tragedy such as public death, etc.